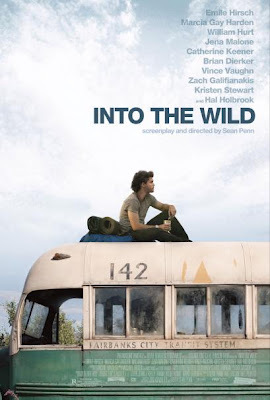 I hadn't just sat and watched a film in ages, probably since before Tweetathon but AT had said I must see Into the Wild and so I borrowed it from a friend at work and watched. It was pretty much clear why right from the start. This isn't going to read like a normal film review, because, well, it isn't a film I could write a normal review for. It's a true story about a young guy who rejects society and decides to pack up his life in a ruck sack and travel across America with no money and leave his disjointed family life behind. Why did AT want me to see it? Two reasons I think. I was reminded of me, that not quite fitting in anywhere thing, a square peg in a round hole and also that urge to 'go see things' that I currently have. The story is an emotional journey as much as it is a road trip, one where an intelligent but troubled kid becomes a man by leaving everything behind and the impact on his family slowly unfolding alongside his story as they try to understand his disappearance. The scenery is at times completely stunning the beauty of the world helping him to find himself as much as the books that he buries himself in. Watching it after reading Endymion a few weeks back I'm struck by the two messages that I've been left with and I'm not sure I can ignore either of them or really explain how those messages will impact on 2011. But I think I have to carry them, not just for a year but for good. What are the messages? They're mine. Sorry. I think I have to go travelling. I don't plan to hike into the wilderness of Alaska like Christopher McCandless but I do feel like I need to escape for a bit this year, to find a bit of happiness in a view and then come back and share it. You'll need to see the film to get that I think. Go rent it, but be warned, you will cry.